Pigeons are responsible for millions of dollars of damage each year. The uric acid in their feces is highly corrosive. 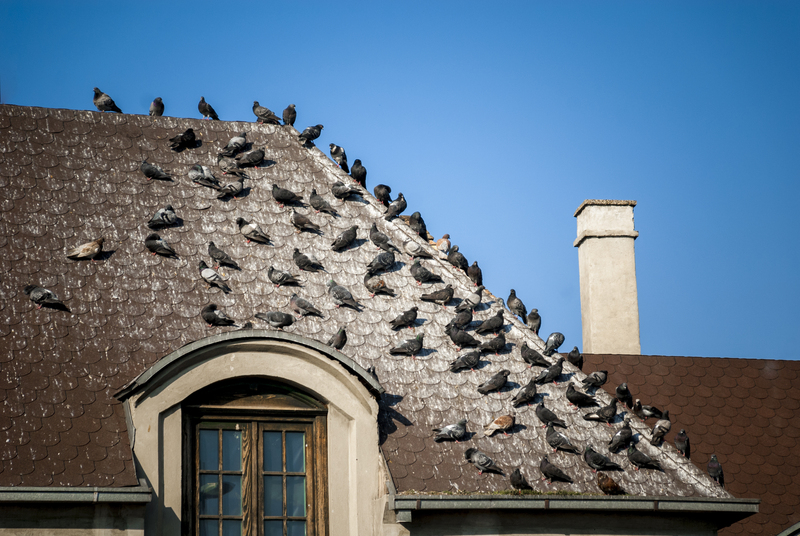 Also, debris from roosting flocks can build up, backing up gutters and drains thus causing damage to roofs and other structures. Extensive damage to air conditioning units and other roof top machinery is common. IT IS MUCH MORE FEASIBLE TO INSTALL A SYSTEM DURING CONSTRUCTION OR PRIOR TO AN INFESTATION. THE COST OF CLEAN-UP AND SURFACE PREPARATION IS EXTENSIVE. Advocate Pest & Wildlife Specialists are the leading experts in pigeon control. We offer our unprecedented service nationwide. Our exception reputation and long list of experience says it all. Did you know every pigeon extraction is unique to the situation? We offer many varieties which includes a solution for each and every pigeon problem. Our trained experts will inspect your property and create a program to fit your needs and budget. With EVERY extraction, sanitation and bacterial control is mandatory along with the feces removal. Pigeons carry numerous diseases that can be harmful and/or deadly. Pigeon feces on outdoor toys, playground equipment, or furniture is extremely dangerous. A dead pigeon can cause the death of other animals that attempt to feed off the pigeon. Do not attempt to remove feces by yourself. The highest danger of airborne diseases is contracted when feces is scraped, brushed and/or removed in a non-professional way. Our technicians are highly trained for proper removal of this material.